Two sisters vanish, one returns three years later and a harrowing tale unravels as the search begins for the girl left behind. 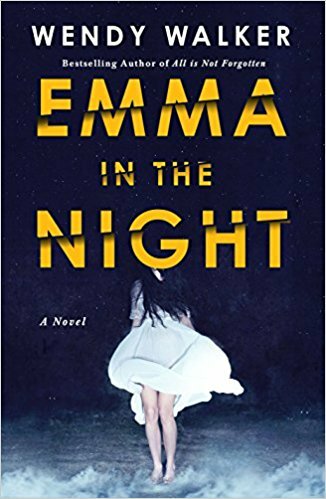 With Emma In The Night, Wendy Walker chillingly explores the depths of one family’s dysfunction and how it connects to the disappearance of two teenage sisters: 17-year-old Emma and 15-year-old Cassandra Tanner. Three years after they vanished, Cass knocks on the door of her family’s home… without Emma. Barraged with questions, Cass recounts a story shaped by secrets and schemes, of kidnapping and fear. They’ve been kept on a small island—she’d been able to escape, but Emma had not. As Cass’ story untangles, a more twisted story emerges: a mother whose narcissism made her callous and cruel, a father who didn’t fight hard enough for his daughters, a stepfather and stepbrother with a wandering eye, and two sisters who fought relentlessly, constantly conniving to win the upper hand. Dr. Abby Winter, a forensic psychiatrist who’d been on the case from the beginning, is immediately skeptical. Things aren’t adding up. In Cass’ detailed recountal, there are gaps, questions, red flags only Abby might recognize. The Tanner family dynamic rages with escalations, reproaches and manipulations—and it’s clear this malignity led the girls to disappear three years ago. But now, could they find Emma before it was too late? And what was Cass hiding? Walker’s gradually moving narrative is expertly layered with tangles aplenty. The tone is chilling with incredulity reverberating at the level of dysfunction within this family. Chapters in alternating voices (Cass and Dr. Abby Winter) offer fascinating perspectives on what could be happening—none which led me directly to the story’s shocking end. If you love a twisted plot tangled all the more through unreliable narration, this is a definite summer must read. I was fifteen when I disappeared. Emma would never have taken me to the beach with her when I was fifteen. She was a senior in high school and I was a nuisance. My purse was in the kitchen. Nothing of mine was found at the beach. None of my clothes were even missing from the house, according to my mother. And mothers know things like that. Don’t they? She busied herself with some dishes. Faucet on. Faucet off. The dish towel fell to the floor. She picked it up. Emma stood on the other side of a giant island. I stood beside her, my shoulder tucked in next to hers, and I leaned toward her so I could dis­ appear behind her body if I needed to. Emma felt so strong to me then, as we waited to see which season it would be. Whether it would be summer or winter.